In many neighborhoods, blocks are more likely to be full of parked cars — and cruising for an open space spikes — after meters shut off at 6 p.m. (1800). Every day at 6 p.m., San Francisco’s parking meters shut down. But in many neighborhoods, motorists continue to seek parking, and without the turnover brought by meters, the streets become clogged with drivers circling around for a spot. 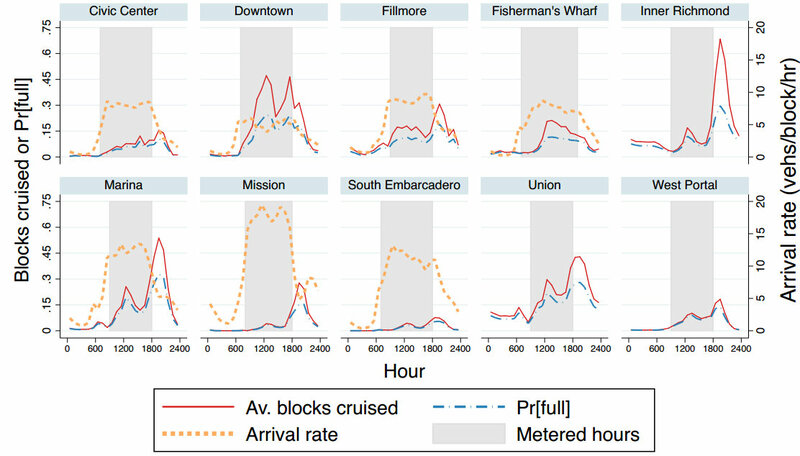 The big mismatch between meter hours and actual demand for curbside parking spaces in SF was demonstrated in a new study of SFpark [PDF], which found that the program has cut cruising times for parking by 50 percent in the areas where it’s in place. The study, featured yesterday in Next City and The Atlantic Cities, was conducted by researchers at UC Santa Cruz, Carnegie Mellon University, and Nelson/Nygaard, who used data on parking occupancy from the SFMTA to model the effect of SFpark on driver behavior. The study re-affirms the findings of a report published in the Journal of the American Planning Association last May [PDF], which showed that pricing parking according to demand is effective in reducing cruising. But as Donald Shoup, parking guru and one of the authors of last year’s study, told Streetsblog in August, the successful SFpark program goes to waste after 6 p.m. due to SF’s outdated meter hours, which were crafted in the mid-20th century when fewer businesses were open past that time. As the graph above shows, the biggest spike in evening cruising is in the Inner Richmond, a non-SFpark neighborhood studied as a control sample. Cruising there peaks at about 8 p.m. In every area except downtown and Fisherman’s Wharf, the daily peak in traffic caused by cruising was after 6 p.m.. If Mayor Ed Lee wanted, he could nudge the SFMTA to simply extend meter hours to cut traffic on the streets in the evening. But rather than fixing SF’s traffic problems, Lee has been more inclined to use his influence to move the city in the opposite direction by undoing Sunday parking meters. I, like most everyone hates to pay for parking, but you just cant ignore the facts that SFpark works and demand based pricing benefits everyone. There is no requirement that people drive, and there will ALWAYS be demand in the neighborhoods with people looking for free parking. BUT for the people who are willing to park at a meter, they need turnover. I bet a lot of the immediate post metering traffic is with people in the neighborhood looking for a place to park all night, but that does NOTHING for the businesses. Traffic and lack of parking because people are looking to store their cars overnight detracts other people to drive into the neighborhood. Exactly the opposite of what the metered parking is there for. That said, there will be people who pay until enforcement ends, but there will be fewer, and it will generate revenue for the city. But when the price is right and limits are reasonable, people will not be bothered and will be able to have dinner without the hassles of driving in circles to find a place to park. I still recommend the benefits of taking transit, but that is not always an option, and well frankly it doesn’t make sense as the evening progresses, and sure gets costly when you could have carpooled just as easily. For planners, I think a remaining gulf to bridge is effectively communicating that convenience carries a cost – and that that (albeit very low) cost is worth it, particularly as it is effectively an investment in making every other mode work better. SFpark already has this message, but it will really take more to help the general public truly understand this relationship. Berkeley is about to consider doing this. It may be an uphill battle. This simulations for cruising are overly optimistic. They authors predict that 91.7% of the time someone will find an open parking space on the same block. How do they know where the driver is going? A driver might park at the first open space, then walk 2-3 blocks to their destination. Then the 91.7% looses meaning. Then they are comparing the Inner Richmond with fewer parking meters with other areas that have a high number of parking meters. Apples and oranges. Austin has extended its parking meter hours to midnight in a select area downtown on weekend nights (Thu, Fri, Sat). It has been a qualified success, as parking is still underpriced at $1 / hour, especially Friday and Saturday nights, the periods of highest demand out of the whole week.